A fiery spicy chutney made from garlic cloves and red chilies is a taste enhancing, must have accompaniment, for south Indian dishes like dosa, idli, medu vada, etc. 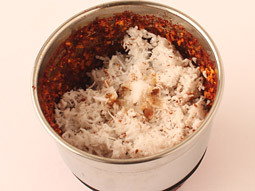 In this customized Indian garlic chutney recipe, garlic, soaked red chillies and coconut are first sautéed in oil and then crushed with tamarind pulp to make delicious chutney having complex hot, sour and spicy taste. Heat 1 teaspoon oil in a pan. 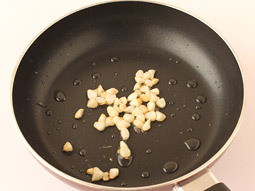 When oil is hot enough, sauté chopped garlic over low flame for a minute; transfer to a plate. 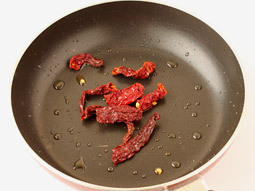 Heat remaining 1 teaspoon oil in same pan and sauté dry red chillies over low flame for 20-30 seconds. Transfer them to the same plate. Let sautéed garlic and dry red chillies cool for 3-4 minutes. 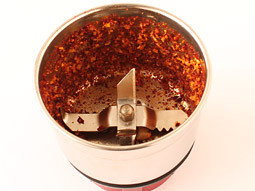 Transfer garlic and dry red chillies to a grinder jar and grind them to a medium coarse paste. Add grated coconut, tamarind pulp, 1/4 cup water and salt. Grind them to a medium coarse paste. South Indian garlic chutney for dosa and idli is ready. 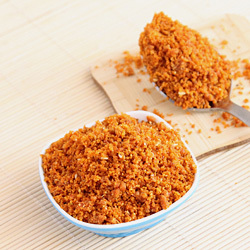 You can also use 2 teaspoons red chilli powder in place of dried red chillies. Dry kashmiri red chillies are added to get nice red color and to make less spicy chutney. Replace tamarind pulp with 1 teaspoon lemon juice for a variation in taste. Serving Ideas:Even though this recipe prepares garlic chutney specifically suitable to be served with dosa and idli, it can be served as an accompaniment in traditional Indian meals. Tried garlic chutney with kashmiri red chilly and cumin seeds. Used row kashmiri chilly. I made it and it tasted beautiful. How long will chutneys keep? Response: Hello Elsie, this chutney stays good for 3-4 days in the refrigerator. Can we store in refrigerator for a week? Response: Yes, you can store it. So good recipes here. Thank you very much. Actually I have a plan I want to open a dosa shop that's the reason I was looking for variety of chutneys. Now my searching ends here. Now I got lots of chutney recipes here. Thank you once again. Response: Hi Leela, I have used the bajaj mixer grinder to make various types of chutneys and paste for the different type of curries in all recipes. You can use any Indian style mixer grinder which has either 2-3 jars. 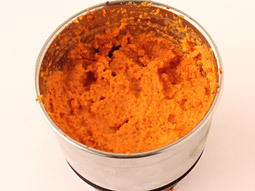 Use small chutney jar to make paste, chutneys and grind dry spices powder (in small quantities). If you are in USA then you can buy this Indian style mixer grinder online on amazon.com.